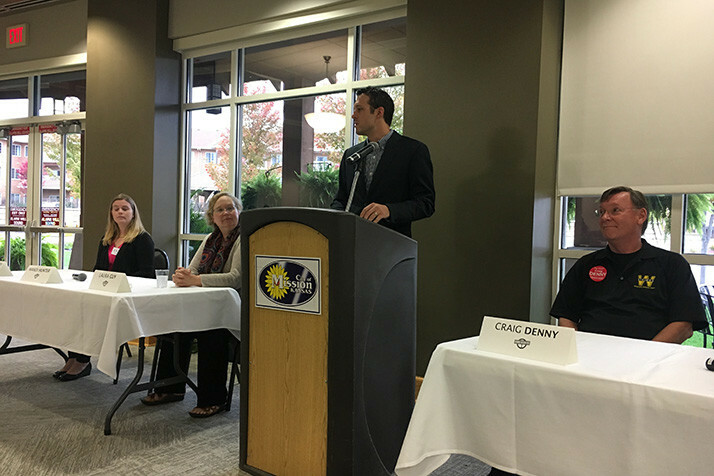 The six candidates running for the three board of education seats on this November’s ballot on Saturday addressed a series of issues that hadn’t been brought up at previous forums. At the event, organized by the Shawnee Mission Post and hosted at the Sylvester Powell, Jr., Community Center, at-large candidates Mandi Hunter and Heather Ousley, SM West area candidates Craig Denny and Laura Guy, and SM East area candidates Jim Lockard and Mary Sinclair, tackled the future of SM North’s Indian mascot, the district’s process for open forum comments by patrons, and whether boundary changes could help correct socioeconomic imbalances at schools. Education First Shawnee Mission filmed the event and streamed it on Facebook. We’ve embedded that video at the bottom of the post. • Are you in support of the continued use of the private “cluster meetings” that board members have with the superintendent before their public board meetings? • At present, Shawnee Mission graduates get handed their diplomas by a member of the Board of Education, not the building principal. Who do you think should hand them their diploma? • The district gets $1 million in new money tomorrow. Where would you like to see it directed? • What are some of your favorite initiatives under way in the district right now? • Sixth grade — should it be at the middle school level or stay at elementary? • What’s your favorite item on the hot lunch school menu?